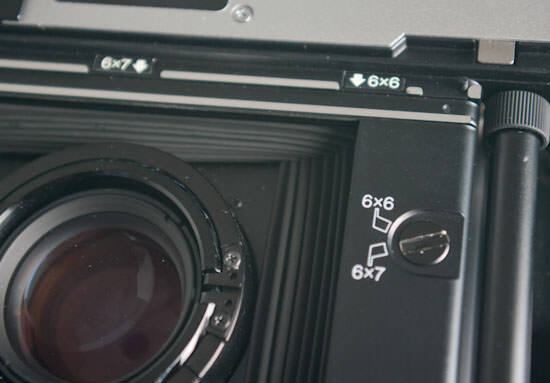 If you've come from a medium format background the GF670 Professional's feature list will be pretty much what you're used to, but those taking a first step from digital to a camera like this may wonder where the features are. This is, like many medium format cameras, a workhorse with a simple, but functional feature set. The lens is fixed and manual, no zoom, no autofocus, no image stabilisation, no ED, APO or other jargantic (new word!) extras. It's an 80mm focal length lens, that's equivalent to 50mm on a 35mm camera, with an aperture range from f/3.5 to f/22 in half step increments. Focusing is a manual system with a rangefinder focus aid. For those unfamiliar with this, it's a small rectangle in the centre of the frame showing an overlaying image. 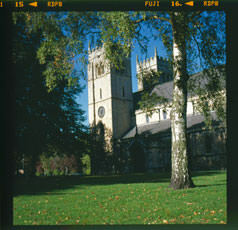 You adjust the lens distance until the smaller image matches the main one to indicate correct focus. You do get a depth-of-field preview scale which is lacking from many modern lenses. The lens has a 58mm filter thread but you must remember to take the filter off before shutting the case or you will do damage as there's no space for a filter, or for the lens to be on any setting other than infinity when you shut it. 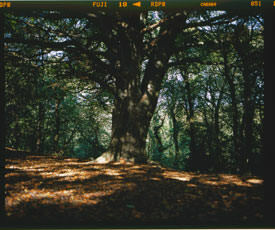 The camera takes 120 or 220 film and you can shoot in 6x6 or 6x7cm format. An internal switch needs to be set to the format you want to use and it cannot be changed mid roll. The brightline frame in the viewfinder adjusts to show the format you're using and automatically corrects for parallax. You have a choice of aperture priority or manual exposure modes, and in aperture priority you can apply exposure compensation in 1/3 stop step to +/- 2 stops. Films from ISO25 to ISO3200 can be used, although you could use the camera in manual if you wanted to push films like Kodak T-Max beyond this. 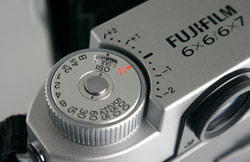 A conventional camera with the conventional shutter speed dial and exposure compensation scale. Easy to see, easy to set. 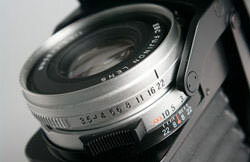 The 80mm lens has apertures from f/3.5 to f/22 and even a depth-of-field scale. All solidly built and smooth/positive to adjust. 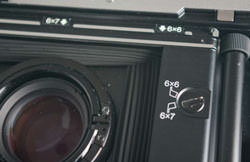 The film format switch is inside and can only be set once before the film is loaded. The GF670 Professional has a flash pc sync socket as well as a hot shoe. The design of the GF670 Professional is such that it's slender to carry and, while big, it's easier to carry around than a standard SLR style medium-format, such as the Hasselblad 500 or Bronica SQAi. It's far quicker to use too. 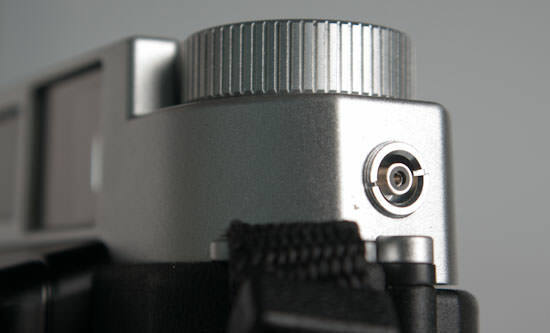 A single release button on the lens cover pops the lens out on a hinged bed. Bellows provide the necessary extension between the lens and film. It looks very much like a vintage folder from the likes of Voigtlander, Agfa or Kodak, albeit in a steroid-sized body. The good thing about this is that you can carry the camera around and go to places you may not have considered taking a typical medium-format to. The easy of use and lack of need of a tripod means you can hand hold in and shoot snap shots, so great for family days out if you want to take some serious shots on the way. 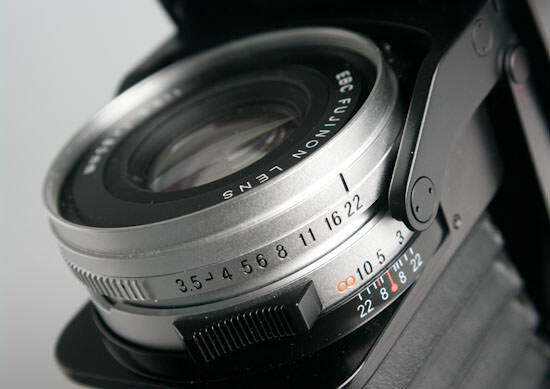 The lens has a well built feel, with very smooth focusing control. The finder is large and easy to see through and has a rubber edge so you won't scratch glass. As a spectacle wearer you won't have any problem seeing the shutter speed LED down the right, but you may find you can't get close enough to see the edges of the brightline format frame, especially when using 6x7 format. A diopter correction lens would resolve that. 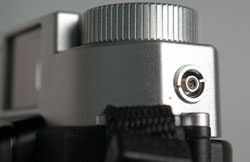 The shutter release button has a cable release thread and is soft to trigger. So soft that sometimes it's hard to tell if the shutter fired. I couldn't hear (or feel) it at all when taking shots in a public place where there was surround noise. The aperture adjusts with a good solid feel and positive clicks but you cannot grab both sides and the serrated ring is quite fine so a more lever like grip would be useful, like there is on the focusing ring. When focusing I like the way the brightline frame corrects for parallax as you move closer, this really does simplify closer shooting and saves you having to remember to apply compensation. I also find the LED light easy to see. This all goes to taking away any calculations making the composition and subject matter take the main stage of importance. 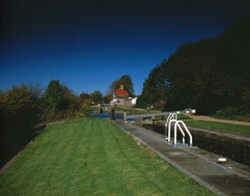 The lens provides sharp results with good contrast. It has slight barrel distortion but nothing to worry about. The overall evenness of illumination is good too producing shots with even tones into the corners of the frame. It appears quite neutral in colour too. 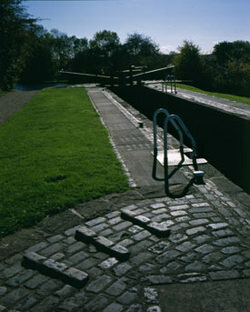 The metering system is similar to centre weighted. It's a sensor above the lens near the viewfinder so you have to remember to compensate if you use filters. I tried a polarising filter and allowed one stop exposure increase whereas two would have been better. I put the meter to test in a number of tricky conditions and it performed well. From shots in low light interiors to very contrasty outdoor scenes. The film latitude is the only thing that let it down. You can't easily do HDR on one of these beasts! I also checked out the accuracy of the viewfinder and found the parallax frames worked well. I got more or less what I was expecting when the films where processed so all in all a good all-round performance. Below are a few shots taken with the camera. 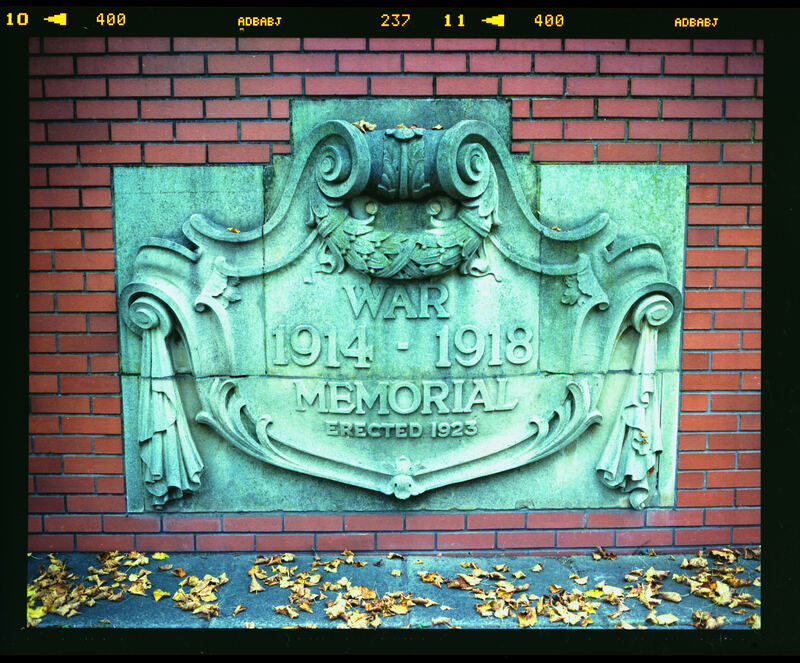 I've included a larger version of our colour test set up and the war memorial plaque so you can get a feel for quality, but remember these pics are scans of the originals so we are degrading the original with scanner resolution limits etc. 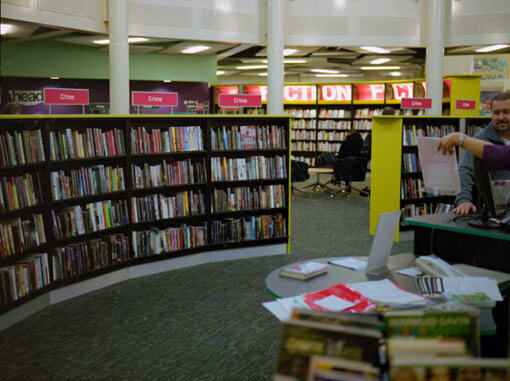 The films were processed by The Darkroom in Cheltenham and were then scanned using an old Microtek Scanmaker 6800 flatbed with transparency hood. A purpose medium format film scanner would be a better option if you're going to get this camera and want digital files. Or ask the lab to create a CD when they process the films. On our test bench, colours are accurate, the lens is sharp, and there's minimal vignetting. Click on the photo to see a larger version. The sun was just out of frame and the lens has coped admirably with what could have been a flare packed shot. 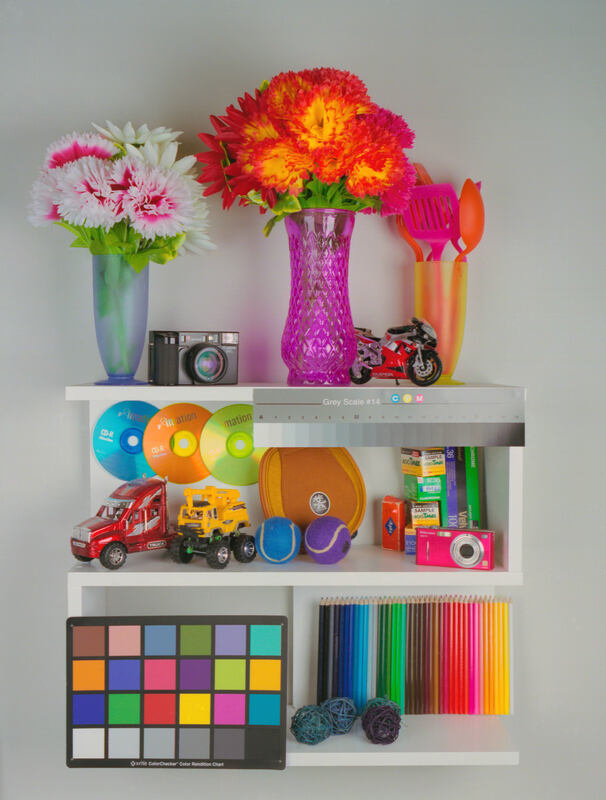 The camera is light and portable enough to use hand held, making interiors like this easier. The meter and auto exposure has handled the scene well. 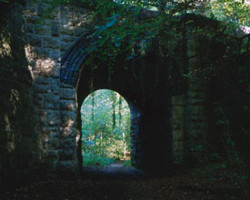 Dark foreground and a bright distance beyond the tunnel. Couldn't expect better from a metering system. HDR would be used on a digital camera. A 58mm polarising filter was attached to the lens and a grey graduate held over the lens to see what it was like with filters. I didn't compensate correctly so ended up with a dark result. 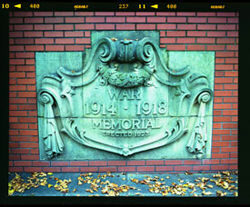 In this shot of a war memorial I was looking for lens distortion, sharpness and viewfinder accuracy. I've provided a larger scan of this click on the thumbnail to view. There's a minimal amount of curvature, which I wasn't expecting from a standard lens, but it's sharp and even contrast. The viewfinder is also accurate as this is pretty much what I expected from the frame. It's been a long time since I exposed a roll of medium format film. I'd forgotten how useful the large format was. It's a convenient design so you don't feel troubled by taking it out, and the single lens and limited controls really makes you think about the photo you're taking. The camera is solidly built and inspires confidence. I found the 80mm is restrictive, I'd prefer a slightly wider lens, but it does depend on the subject. We've grown used to shooting using super zoom lens ranges and it takes a while to get back into the fixed lens thinking especially with such a standard lens. In the old days Fuji would have produced two versions one with a wider lens for landscape and architecture, but I'm surprised we've even seen this one option. It's a lot of money for such a limited scope. Not a camera I would consider If I wanted to go back to film I'd prefer to look round for a Mamiya 7 with the flexibility of interchangeable lenses, but the lightness and lack of trappings will no doubt suit travel and adventure users who have more important stuff to pack in their bags and the space this provides will be welcome. Focusing range 0.9m to infinity. Thanks to Fujifilm for the Provia 100 slide film and Superia 400 negative film. Thanks to The Darkroom in Cheltenham for the film processing. Have Fuji got over the problems Yashica had with the pressure plate capability of dealing with the backing paperless section of the 220 rollfilm? I an seriously considering one of these cameras. I also understand that it comes with a case, strap and lenshood. It takes 58mm filters, more expense and it would appear dealers at offering 10 rolls of film free when purchased, big Deal. My slight concern is the cameras build quality. 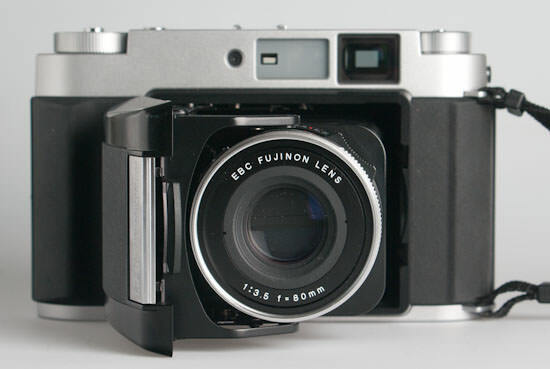 I am used to Leica brass and mag Alloy as opposed to pressed steel or whatever the Fuji is made from. Fixed lenses are not a problem as my Rolleiflex 3.5f is the same format just 50 years older.